So, the Emmys happened, again. This year's telecast was not spectacularly bad, but it was certainly a slow-moving train right through Yawnsville. The fashions were not totally unfortunate, but there were very few highlights if you ask me. Still, let's review them anyway, shall we? First off— the most stylish couple of the night, Rose Byrne and Bobby Cannavale, who won Outstanding Supporting Actor in a Drama Series for Boardwalk Empire. Both wore Calvin Klein, and the effect was sharp, expertly fitted and completely stunning on both accounts. From his perfectly parted hair and practically-born-in-it-good tux, Bobby looked just as attractive as his sophisticated mid-riff-baring date. And say what you will, I loved Claire Danes in Armani Privé. Agree? Disagree? Let's discuss after the jump. Click through, y'all. Pretty! Interesting! Good lipstick! I love a good paillette sequin, and I think the effect with the tiny rhinestone straps and lace skirt is ethereal and lovely. Taylor Schilling in Thakoon is a perfect example of how to wear white without looking bridal on the red carpet. Not to mention, she's carrying an Amanda Pearl 'Octo' clutch! Simple, strappy shoes and a great bracelet? Done and done. Michelle Dockery in Prada was really the only full-skirt look I was okay with the whole night. The color contrast is chic and interesting— I just could have done with a different hair situation. 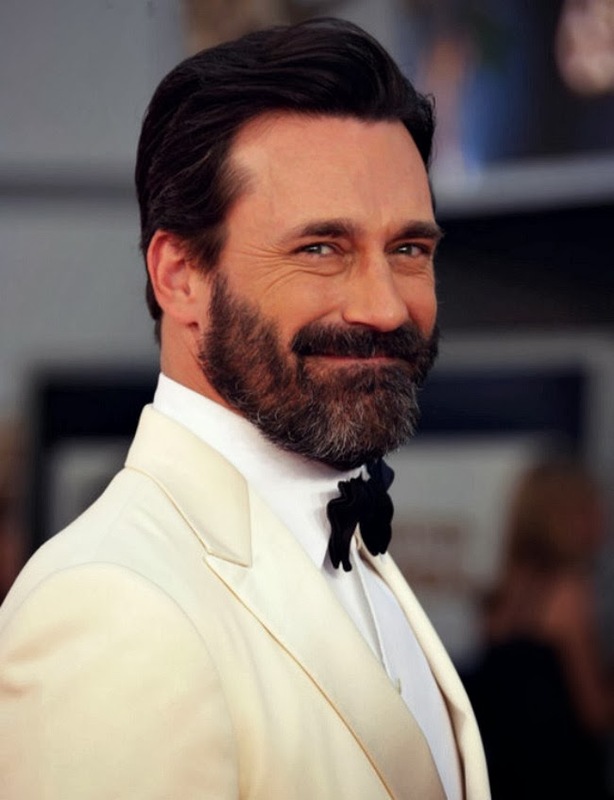 Last but not even a little bit least, Mr. Jon Hamm in Georgio Armani sort of killed me, in a really good way. I love that he wore a white dinner jacket, and he was one of the only guys to show up with a full facial hair situation. His salt-and-pepper beard was a sharp contrast to his finely tailored tux, and... Mmm. Just, handsome. Honorable mentions go out to Tina Fey in gorgeous Narciso Rodriguez, Kate Mara in J. Mendel (with pockets!) and the excellently suited Breaking Bad boys, Bryan Cranston and Aaron Paul. totally agree with all of your picks. I loooooved Taylor and Mara as favorites. Clare disappointed a bit because i though the top looked silly. also HOW DID I NOT KNOW that rose and bobby were dating? absolutely in love with rose's gown..........liked claire's, but not with her skin tone. Rose though!! I was blown away, couldn't believe it was her! rose and bobby look flawless - she always has amazing red carpet dresses! I love the first dress and the second is pretty, too. I do not, however, like the colors in that Prada dress. The contrast is such that it clashes in my opinion! Ick, get it out of my eyes!